Because the dzong is so beautiful and the setting so peaceful, this was my favorite place in all of Bhutan. The second oldest dzong in Bhutan, it was begun in 1637 also on the order of Shabdrung Ngawang Namgyal. The dzong was significantly expanded from 1744-1763 during the reign of the 13th desi (the secular ruler, as opposed to the Je Khenpo, who is the chief abbot of Bhutan, and who holds equal power), Sherab Wangchuk. 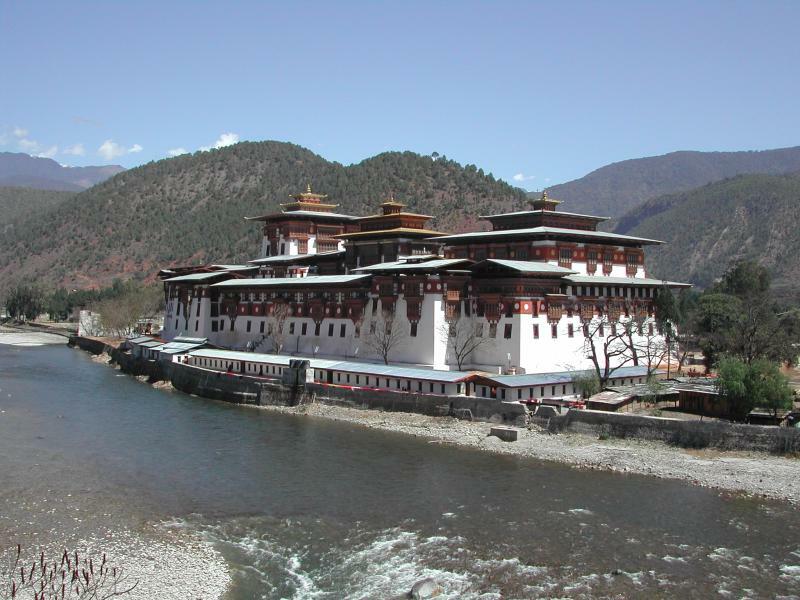 The dzong has suffered numerous fires and was significantly damaged by the 1897 earthquake. The current king has ordered all repairs to be done using traditional methods and materials. Click here to download a full size image. Caution: Full size images are about 2 million bytes and may take a long time to download. Image copyright (©2003) by the photographer (Henry David Shapiro). Noncommercial use by others permitted. Commercial use by express permission only.